6 Questions to Ask Before Choosing a Medical Billing Partner - Outsource Management Group, LLC. “1. What qualifications and credentials should I look for? The billing firm must have policies and procedures that maximize the efficiencies of practice work flow and minimize the time it takes to get paid. In the wake of the HIPAA Omnibus Rule, billing companies also must have a rigorous compliance program that ensures the privacy, security and confidentiality of protected health information (PHI). 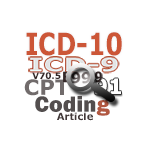 Why are providers suddenly so confident about ICD-10? Visit our blog to read additional material authored by our staff and guest authors related to ICD-10, ICD-10 billing and coding, ICD-10 revenue management, etc. The ongoing daily archive of ICD-10 Information!